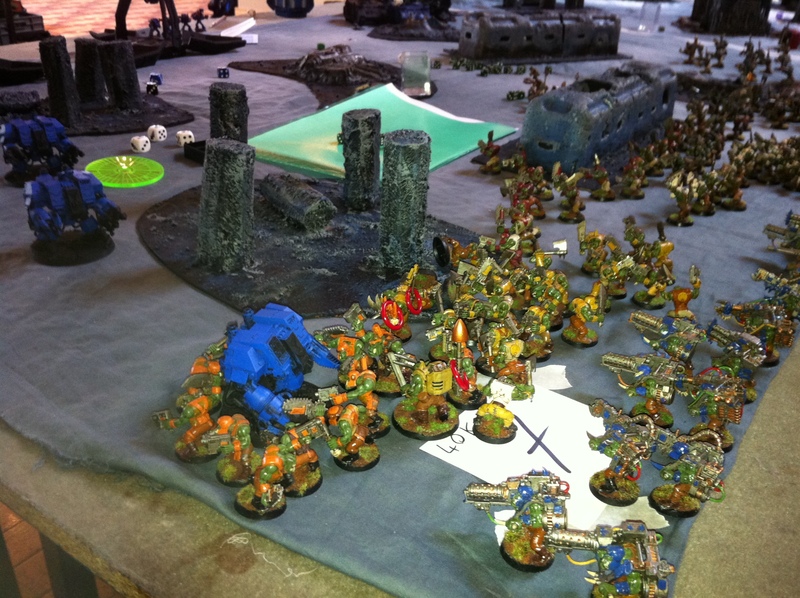 The North Wexford Gamers run an annual 40k (and Fantasy) tournament in Gorey, but with a twist. It’s a fully ranking tournament, but they move away from the standard Irish tournament format by pushing the points limit up to 2000, and allowing Forgeworld units (but not superheavies, gargantuans, strength D or the other Apocalypse scale stuff). The atmosphere was great, and I think the unorthodox format lends itself to a more lighthearted approach to the games. Rules arguments were generally settled in mere seconds with both parties jumping to be the bigger man (usually resulting in a 4+ roll to resolve things). 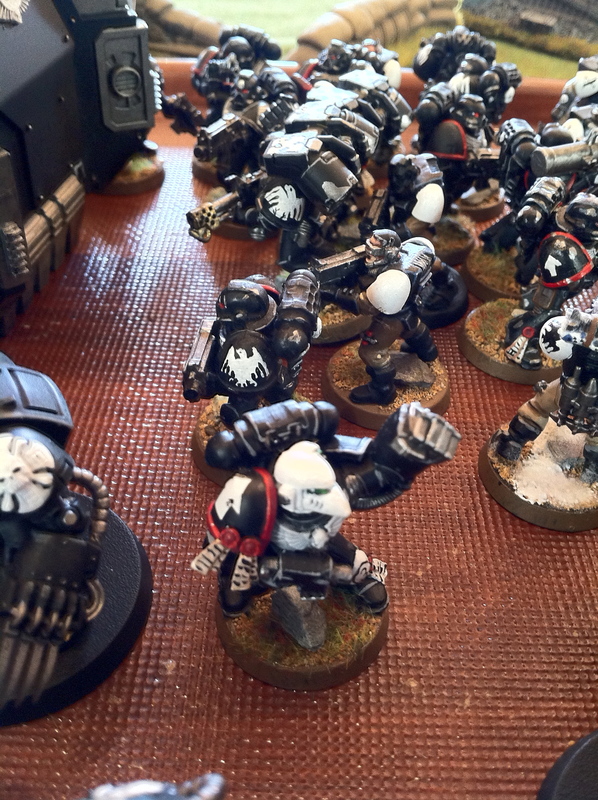 My first opponent was John O’Connor, who was running a beautiful Raven Guard army. John was just returning to 40k after a bit of a hiatus, we had a great game, but the super shooty nature of my list was the undoing of his more balanced force. 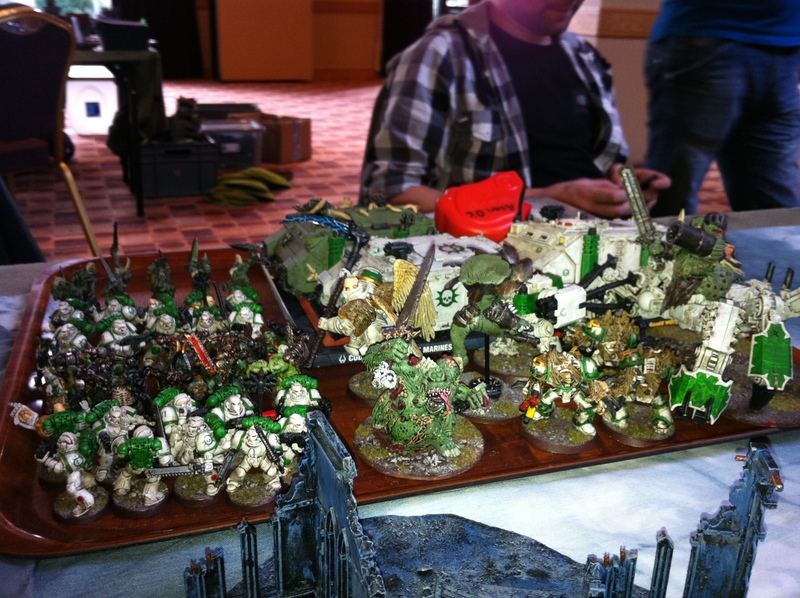 Second opponent was Adam O’Connor, who was running a Death Guard army, with a Forgeworld Blight Drone and Plague Hulk. After some aggressive deepstriking I thought I had the jump on Adam, but after a rake of 5+ invulnerable saves it was clear that Adam thought otherwise. I hadn’t scratched him and had left a bunch of juicy targets right in his front garden. I took some losses, nevertheless I pushed hard for his objective but couldn’t quite make it through his defenses by game end. 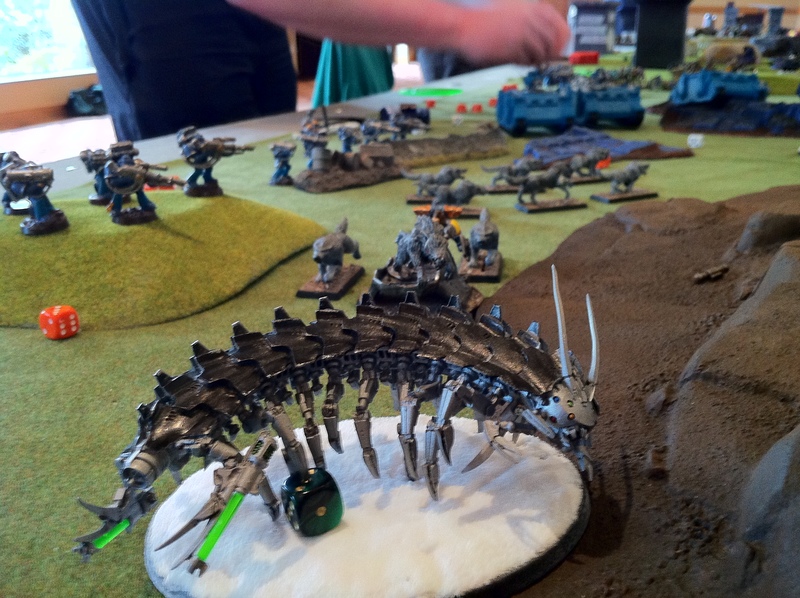 Third opponent was Ger O’Brien, who was running a Space Wolf army, with a Forgeworld Caestus Assault Ram. 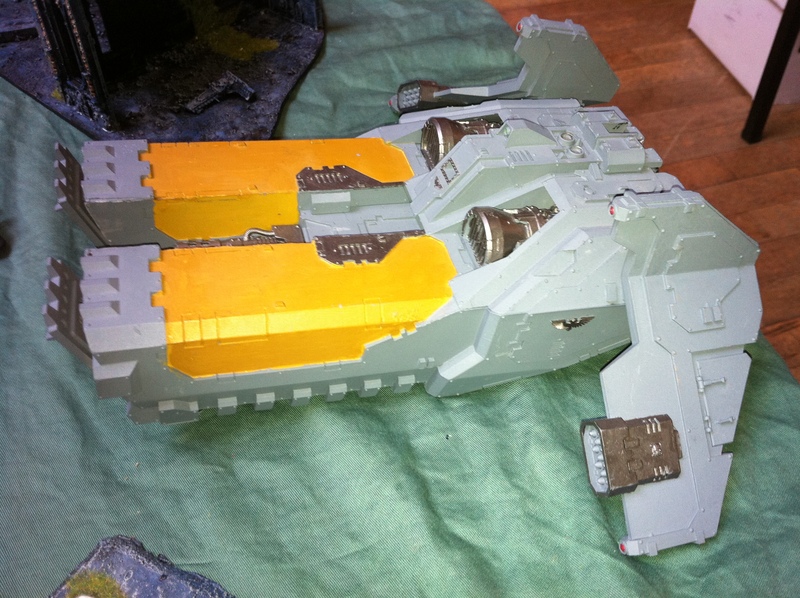 Terrifying list – in particular a Caestus full of assault terminators with meltas; and a drop pod with Logan, Arjac, and multimelta longfangs (relentless thanks to Logan). 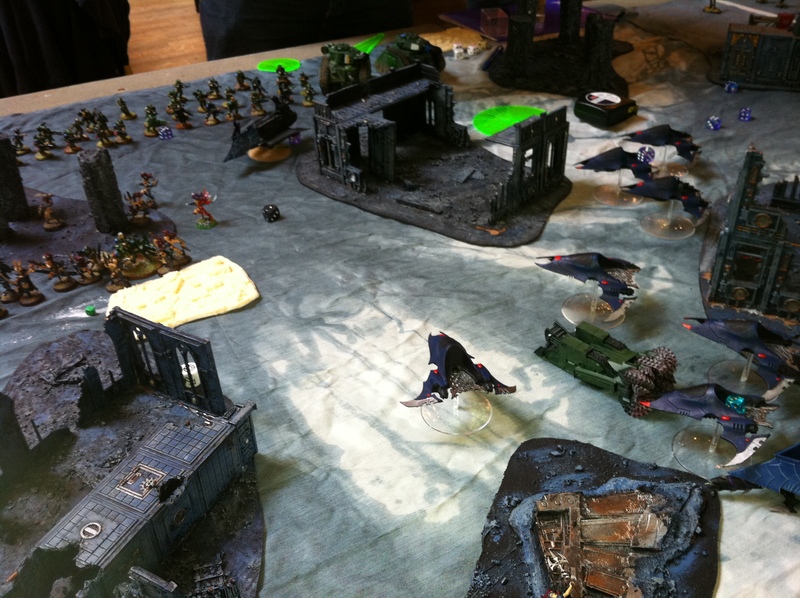 I tried all reserving to avoid my landraiders (and other valuables) getting chewed up by the podfangs, but no such luck. I thought the oblits would be the saving grace as they dropped on his objectives. But after 6 plasma cannon shots all I did was a gets hot wound on an oblit, and the final plasma blast scattered onto my terminators. 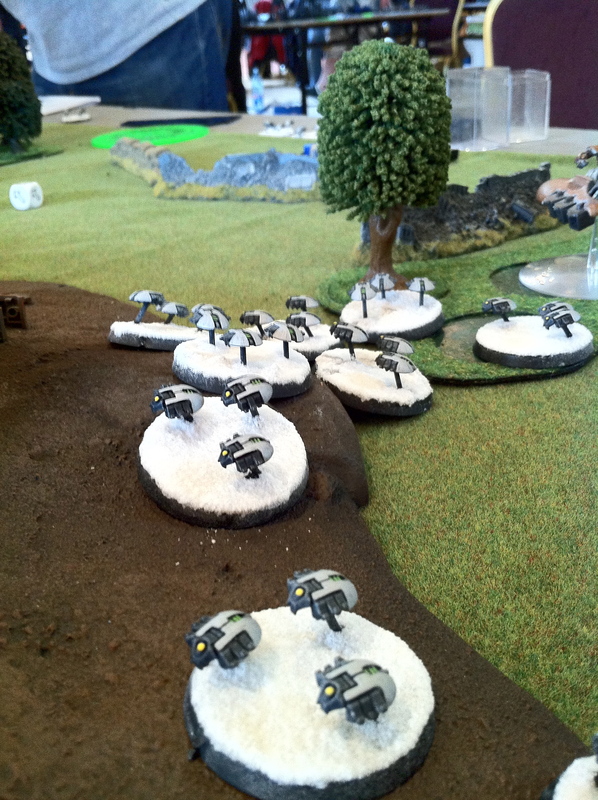 So 450 points of oblits dropped in and did no wounds to my opponent, and did two wounds to my own army… blerg. I took my kicking for several turns, but just managed to crawl some troops onto objectives to get the draw. Fourth up was Eoin O’Mahony, who was running a Necron army. Eoin had been shocked by how well his Necrons (and also John Stowe’s Necrons) had been doing in the tournament. Eoin goes first, and one shots a LandRaider with his Monolith then glances all the weapons off the second (and stunned it for good measure). My oblits try to lascannon the Deceiver to death, but only manage to do one wound – so FOUR left (cheesy broken Necrons!). The shooting continues like this, but I keep throwing stuff at his objectives so he can’t put all his efforts into chasing mine. My Daemon Prince just about makes it to the Necron lines (1 wound left) and manages to assault and run down a full squad of necrons. 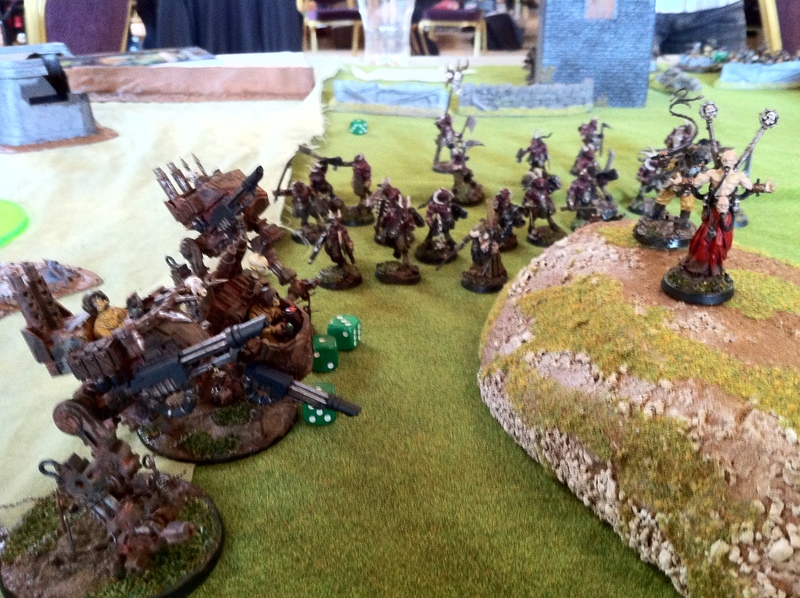 But Eoin still has one left on his objective, and a squad with his lord on my objective. Nurgle to the rescue, bottom of turn 7 my plague marines assault the necrons on my objective, and they break and get run down! Clawed back a draw from what looked like imminent defeat. 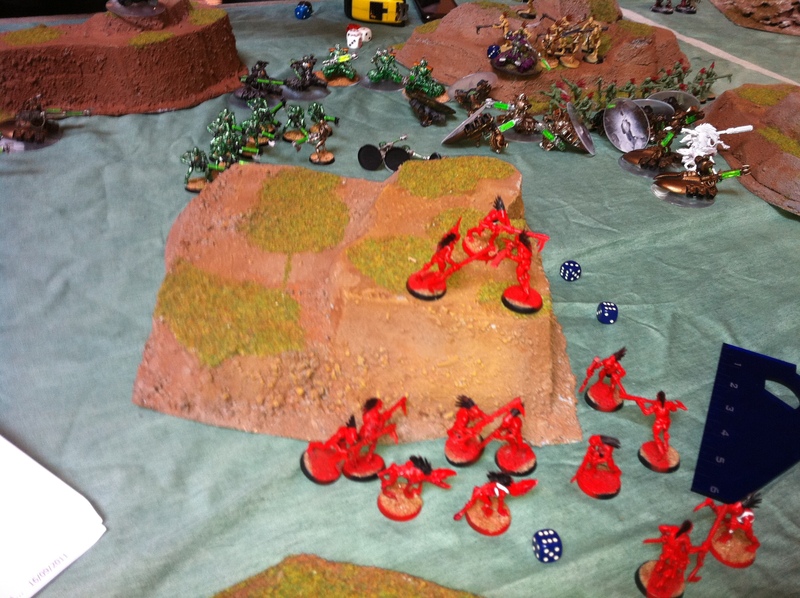 Final Opponent was Colin Murray who had a 9 Oblit Chaos list quite similar to my own. I won the roll for first turn, and having played several ‘mirror matches’ before, I knew that was a big advantage for me. The game went extremely quickly, I had all my shooty stuff coming on turn 1, Colin reserved all his tough stuff. His luck was average to poor, and mine was average to good, and combined with his forces coming in piecemeal meant it was a tough slog for Colin. I’d been in that exact position before, and I knew it was not fun – but Colin was good humoured about it, and was a pleasure to play against. This entry was posted on Monday, September 19th, 2011 at 1:22 am	and posted in Tournament. You can follow any responses to this entry through the RSS 2.0 feed.